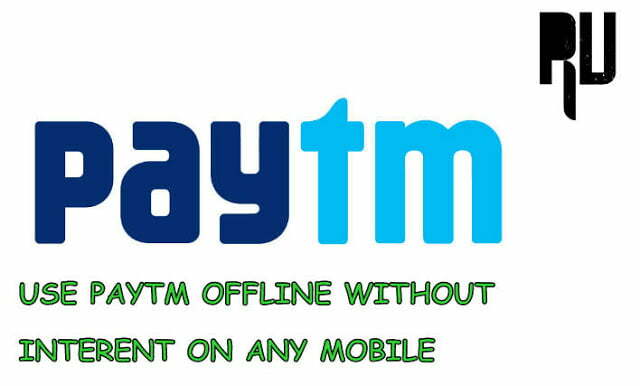 How to Use Paytm Offline Without Internet in Any Mobile . Use Paytm Without Internet offline – Recharge Phone and Send money to Bank account . 1 Use Paytm Without Internet offline – Recharge Phone and Send money to Bank account . 1.1 Use Paytm without internet offline on any mobile . 1.1.1 How to use Paytm on Any mobile without Internet offline . Good News for Non-smartphone users Now you can use paytm without internet pack offline and that to free of cost . In this guide we will share the Trick to Recharge phone and send money to bank account using paytm without internet . We All are very much familiar with Digital wallets like Paytm, freecharge, Mobikwik and many others and they come very handy when we are out of cash or want to recharge mobile without going to shop . Paytm which is undoubtedly the best digital wallet has announced a way to use Paytm wallet without internet connection, And in this guide we will tell you the way with which you will be able Send money to bank account using paytm without internet offline and you can also recharge your mobile on paytm without internet . Usually paytm needs a active internet connection pack and a android smartphone or iphone to run the app or alternatively you can use paytm on Desktop also, But in the end you need a active internet connection to use paytm . But after the PM narendra modi’s announcement Paytm has started a new way to use paytm offline in any mobile . Use Paytm without internet offline on any mobile . With the offline Paytm payment mode now even non smartphone users can use paytm for anything, and by this step of paytm any one go cashless without worrying . There are several uses of paytm like you can recharge your device, you can pay bills, you can shop and a lot more things . Paytm started the offline payment mode because there are many users who still dont own a smartphone and in places like village there is no internet connection . So by Enable offline paytm payment mode paytm has done a great step for many peoples . Idea Free 2G 3G unlimited internet Trick . In the new method all you need to do is a just call a number and then you will be able to use paytm without smartphone and internet . As this guide is simple so you dont need anything special and all you need is a phone ( Anyone whichever you are using ) . Use Jio 4G sim in 3G phone Without root . You dont need any smartphone, you can use paytm now on any device be it a feature phone or smartphone . You dont need internet connection to use Paytm now, All you need is a Sim card ( Any company ) . You have to create a Pin and the Pin will be used to send a get payments from other Paytm users . How to use Paytm on Any mobile without Internet offline . Create a Account and if already created move to next step . Make sure you enter your mobile number in the account and verify it . Now You have to Dial Paytm number to use without internet . Now you have to set a Pin ( Make sure you set a pin which you can easily remember ) . This pin will be required to make offline payment through Paytm . First of all Dial 1800 1800 1234 . Now you will be asked to Enter the Recipients ( The number on which you want to send amount ) Number . Enter the correct mobile number . Now Enter the Recipients 4 Digit Pin , Just like you recipient also have a pin . Thats all !!! You have Successfully Sent the Recipient Amount . So this was our guide on How to use Paytm Without smartphone and internet, I hope this guide helped you .